Most of us have crazy lives, with crazy jobs, and a schedule that is packed from morning to night. For all of your with crazy day-to-day lives here are some of the things I do to help me get through the day without a hitch. With these tips, I promise that you will never be hungry — no matter how busy you are. Cooler – grab yourself a good, soft sided cooler. I have a Packit! cooler. It is awesome because you can freeze the whole thing and it will keep your snacks cold for up to 10 hours. Recently they’ve come out with a ton of different prints and colors so they have something for everyone and they are only $19.95. 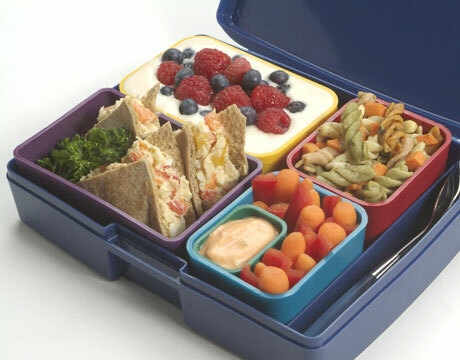 Snack Containers – grab snack containers of all sizes, ones for sandwiches, carrots, dressing. Nowadays they have a container for anything and you can find them anywhere. You can also use foil or snack bags but I love the ability to reuse something, its greener anyway. Check out the Container Store to find everything you’ll ever need! Snacks – packing travel friendly snacks is easy. Fresh fruits and veggies always travel well. Granola is great if you need a good crunch. If you’re a cheese fan like me, grab those mozzarella cheese sticks! Nuts are a great way to curb hunger and you can get protein from this snack. Greek yogurt, is a personal favorite of mine. I could go on and on about what you could bring around with you. What’s important is that you bring what you love to snack on. Apps – lots and lots of apps- on your smartphone of course! You can find reservations to restaurants nearby using OpenTable, or get quick delivery with GrubHub. Check out my other favorite foodie Apps. Freeze it! – If you like your water and fruit cold, freeze them the night before. Not only will they stay cold all day but they will also help keep your cooler cold. Do you have any tips for when you’re on the go? We’d love to hear all about them so share them in the comments below! ← Red Widow: The Next ABC “It” Show? Thanks for the post Kathryn! I’ve been in need of an actual lunch bag to replace the plastic grocery bags I’ve been using so I took your advice and purchased a Packit! cooler. I’m looking forward to putting it to good use soon! Glad that you liked this post and that I could help you in your search of a lunch bag! The Packit cooler is awesome and I hope you love it as much as I do! Enjoy!